You can change the interval and/or due date of a recare that is attached to a patient's record as needed. 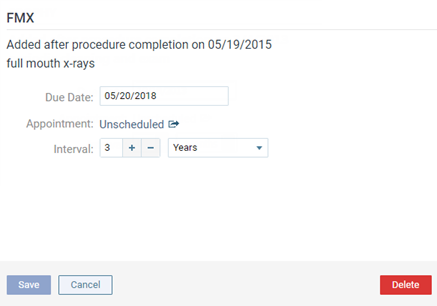 Next to Interval, enter a number, and select Weeks, Months, or Years to specify how often a patient with this recare type attached to his or her record should be seen for this type of recare. The Due Date is updated automatically. 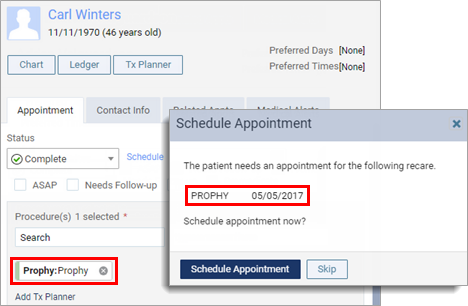 With the workflow compliance feature for your location turned off, each time you complete an appointment with this recare type attached, the due date for the patient's next recare appointment (of this recare type) advances by the specified interval, and a message appears and asks if you want to schedule the next recare appointment. Click (or tap) in the Due Date box, and then select a different date. Changing the due date does not change the Interval automatically. 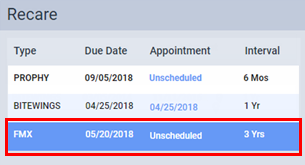 Note: Next to Appointment, if there is a link that reads, "Unscheduled," you can click (or tap) the link to go the due date of the patient's recall in the schedule.